Kyle S. asks: There’s a story circulating around that NASA found out pens didn’t work in space, but still needed a writing device that would work there, so they spent millions of tax payer dollars developing a ball point pen that could be used in space. The Soviet Union, on the other hand, just used pencils. Is this true? Thanks! The humble ballpoint pen is an item so ubiquitous the chances of you not having one near you right now are so low E.T could probably give you the percentage on his right hand. Few people realize just how much technology, craftsmanship and effort goes into creating a single pen- probably because you can buy 30 of them for a few dollars, only to mysteriously have them all disappear within a week. As the name would suggest, ballpoint pens work by utilizing tiny metal ball bearings. In the case of the most famous ballpoint pens of all, Bic, the ball is commonly made from tungsten carbide, which is notably the same material often used to make armour piercing bullets. After the material has been shaped, it’s then highly polished in a machine that uses a paste made from diamonds. Yes, we’re still talking about those pens banks give away for free and you’ve lost three of already today. The polished ball is then loaded into a socket. Due to the fact that the space available between these two parts is supposed to be virtually, but not quite, nil, they need to be accurate to within a thousandth of a centimetre on the ball. If any flaws whatsoever are discovered in the ball bearings during production, it’s not uncommon for thousands of others of these balls that were created alongside the flawed one to be destroyed as well. In fact, to see any imperfections on a ballpoint pen’s ball bearing that makes it to market, you need an electron microscope. So how does the ink even get out? Well, it works mostly via gravity. Gravity pulls the ink down onto the ball which transfers ink as it is dragged along or pressed against paper or a comparable surface. However, the ball bearing also creates a pressurised seal that prevents excess ink from escaping. The mechanism allows for a continuous flow of ink to be used, without risking the ink inside being exposed to air, and in turn drying out. This allows ballpoint pens to write around 100,000 words each. The long and short of it is, without gravity (or some sort of internal pressure source as in “space pens”), the ink won’t flow properly. So this brings us to these space pens. As the story goes, when the space race was heating up, NASA invested millions (sometimes stated as billions) into developing a pen that would work in orbit. However, when the Russians went into space they just took pencils. It’s a famous story that is mostly false. Although Soviet cosmonauts did use pencils in space for a time, so did the Americans. However, it quickly became clear that pencils were a very bad idea since they had a habit of breaking and sending tiny eye-seeking fragments of pencil lead and wood bits into the air. There were also some concerns over these fragments potentially damaging equipment, even perhaps causing a fire. At this point, you might be wondering, “If neither the Soviets nor NASA invested any money into the creation of a pen that could work in space, who did?” Like Tang and Velcro (often incorrectly credited with having been invented by NASA, see: The Invention of Tang and The Accidental Invention of Velcro), the “space pen” was invented in the private sector and was simply popularized by NASA. Specifically, the development of the space pen was undertaken solely by Paul C. Fisher and co. of the Fisher Pen Company. After investing over a million dollars of his own money in creating a pen that utilised pressurised nitrogen (35 psi) to force out a specialized unique gel-like ink Fisher formulated, by 1965 he was in possession of a patent and a pen that could work upside down, underwater, at temperatures from -50 to 400 degrees Fahrenheit (-45 C to 204 C), and even, you guessed it, in space. When Fisher brought his “AG-7” pen to the attention of NASA, they tested it thoroughly and then thanked Fisher by buying four hundred pens from him. But he didn’t get the Tycam Engineering rate of $128.90 per writing device. Rather, they asked for a bulk discount and Fisher ended up selling them the pens for just under $2.39 a piece ($17.42 today), approximately 40% off the normal consumer price at the time of $3.98. Then again, having NASA (and by 1969 the Soviet Union) use his product in space was great advertising; so he did OK and versions of the Fisher space pen are still available today (and write awesome, I might add). This price of $2.39 for a pressurised space pen is not only notable for being 40% off the consumer price, but also notable because a mere two decades before, a standard ballpoint pen would cost you at its cheapest 5-10 times that, well over $100 when adjusting for inflation. This all changed thanks to one Marcel Bich in the mid-1950s. But before we get to Bich, we must discuss a newspaper editor named László Bíró. While in Hungary in 1931, Bíró observed that the ink used in a printing press dried almost instantly. He, like so many others, was also frustrated by the fact that fountain pen ink often smudged, among other annoyances. Thus, he attempted to create a pen that worked with this type of newspaper quick drying ink. His early efforts using fountain pens with this ink failed, which led him to attempt a ballpoint style pen. But the ink still wasn’t quite working. Fast-forward to 1938- after working with his chemist brother, György, the two developed an ink that would dry near instantly, but still flow well. Bíró also perfected a semi-new system that would deliver that ink effectively. 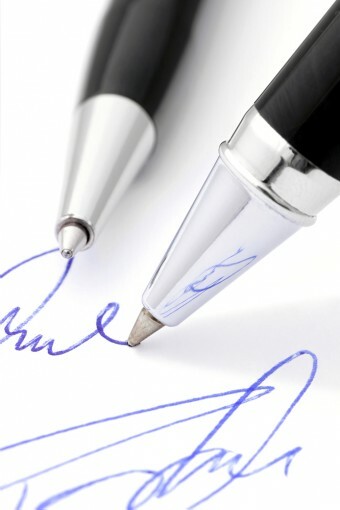 So it was that on June 15, 1938, Bíró patented the first commercially viable ballpoint pen. As with most inventions, the system he came up with, the one involving a small precisely made ball and socket, wasn’t entirely unique. For instance, a near identical invention had been developed and patented some 50 years earlier in 1888 by John J. Loud. However, Loud developed the device as a means of marking and writing on leather (something fountain pens couldn’t do well). A lack of interest in his invention, as well as poor performance of the device due to flaws in the design, prevented it from becoming commercially successful and he never renewed his patent. Many others came along in between Loud and Bíró with similar devices that were similarly failures for various reasons such as uneven ink-flow, clogging, and leakage. In the end, Bíró’s pens were the first commercially viable ballpoint writing devices. Because of this, not only is he generally given credit for inventing the ballpoint pen, but the name by which many ballpoint pens are still known by in many parts of the world today is “biro”. This all brings us back to Bich and how ballpoint pens finally became not only extremely popular, but ridiculously cheap given the precision required in their making. Bich saved his money until he could afford to buy a rundown factory in France- a factory that would soon become the centre of his massive pen empire. After acquiring the factory, Bich bought the rights to Bíró’s ballpoint pen patent and perfected the means of mass-production while maintaining quality. He then started creating as many pens as he possibly could. As he mass produced millions upon millions of them, Bich was able to undercut his biggest rivals and sell pens that were as much as one three hundredth of the then normal price. In addition, due to his exacting mass production methods, along with being hundreds of times cheaper, his pens were also better quality in terms of their utility- “Writes the first time, every time,” as the 1960s company advertising slogan went. Needless to say, sales, and the popularity of the ballpoint pen, skyrocketed and by the time Bich entered the American market, he was able to sell pens for mere pennies, instead of dollars. And the rest, as they say, is history. What is a ball point pen? When I was growing up in Italy we commonly called Ball Point pens “Penna Biro” where “penna” is the name for “feather” but also means Writing Pen (I am sure Eagle Eyed readers can see the similarity here) and “Biro” was simply assumed (at least by me) to be the kind of pen. I learned of Mr. Biro and his invention only many years later. Thank you for the article. As usual very interesting. PS: I used to have several “space pens” over the years. I still have one someplace in the house. I always loved their design (I always bought the “bullet” kind) and they write really well. I prefer them to most of the modern “Gel” pens. Thanks for the knowledge, some things are hard to find info on&you have them all here! Great article! As a pen manufacturer, we’re always looking for extra pieces of pen lore. Thanks for the post. BTW, the Pentel Sign Pen was standard issue on two space missions in 1965. Gemini 6 and Gemini 7 astronauts carried a Sign Pen in their sleeve pocket as the fiber tip and ink delivery mechanism does not require gravity to perform properly. Nice post!! Its surprising that you got all the bits and pieces of info and you are able to put it in one page so neatly. Appreciate it!. You left out the whole part about scribbling to get the ink flowing. They say that the ball creates a perfect seal that keeps the ink from drying out, but it doesn’t always work that way. How many times have you picked up a ballpoint pen, started to write something and found that all you’re doing is leaving indentations in the paper? Then you look around for a piece of scrap paper to scribble on and vigorously rub the tip back and forth until it starts leaving a trail. You know for a group of people with Master’s degrees and Doctorates you sure miss crucial things from time to time. Where is the mention of capillary action? And why is it often necessary to put something under the paper you’re trying to write on to get the ink to flow?